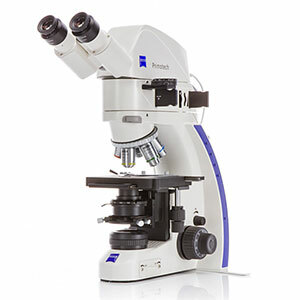 Microscope Primotech D/A cod., stage ESD, integrated IP Camera 3MP included - Microscope stand Primotech D/A, LED, 5x W0.8 cod., stage ESD, base plate and dust cover - Reflected-light illuminator with LED 3W 5000W - Transmitted-light illuminator with LED lamp 3W 5000K with condenser 0.9 - Filter slider 2x, with conversion filter (3200K), d=25 mm - Slider for oblique illumination - 2x eyepiece E-PL 10x/20 Br. foc. - Tube 30°/20 with integrated IP Camera 3MP - Calibration slide for App - Interface module MNA basic for network communication via Ethernet and Matscope App. Interfaces: - 1 x RJ45 for Tube with integrated camera - 1 x D-Sub for connection to the microscope - 1 x RJ45 Ethernet for network access - 1 x Power supply via Primotech stand - Objective Epiplan 5x/0.13 W0.8'' - Objective Epiplan 20x/0.4 W0.8'' - Objective Epiplan 50x/0.65 W0.8'' - Leveling press with starter kit - Power supply 12V/30W The camera is network-enabled and can exclusively be used with the ZEISS iPad App, Labscope or Matscope. The Apps are available as a free download from the Apple App Store. Unless otherwise stated by the distributor, iPad and WLAN router are not supplied by ZEISS. 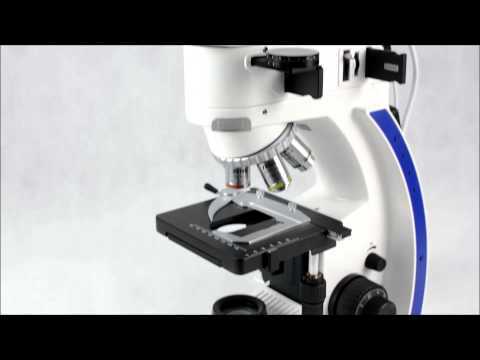 Microscope Primotech MAT cod., stage A, integrated IP Camera 3MP included - Microscope stand Primotech MAT LED, 5x W0.8 cod., stage A and specimen holder plate MAT, max. sample height 34 mm, base plate and dust cover - Reflected-light illuminator with LED 3W 5000K - Transmitted-light illuminator without condenser - Filter slider 2x, with conversion filter (3200K), d=25 mm - Slider for oblique illumination - Polarizer slider A, fixed - Analyzer slider D/A rotat. 360° - 2x eyepiece E-PL 10x/20 Br. foc. - Objective Epiplan 5x/0.13 W0.8'' - Objective Epiplan 20x/0.4 W0.8'' - Objective Epiplan 50x/0.65 W0.8'' - Leveling press with starter kit - Power supply 12V/30W - Tube 30°/20 with integrated IP Camera 3MP - Calibration slide for App - Interface module MNA advanced for network communication and saving of microscope configuration and scaling via Ethernet and Matscope App. The Advanced type enables the use of full Matscope functionality including advanced measurement and automatic scaling. 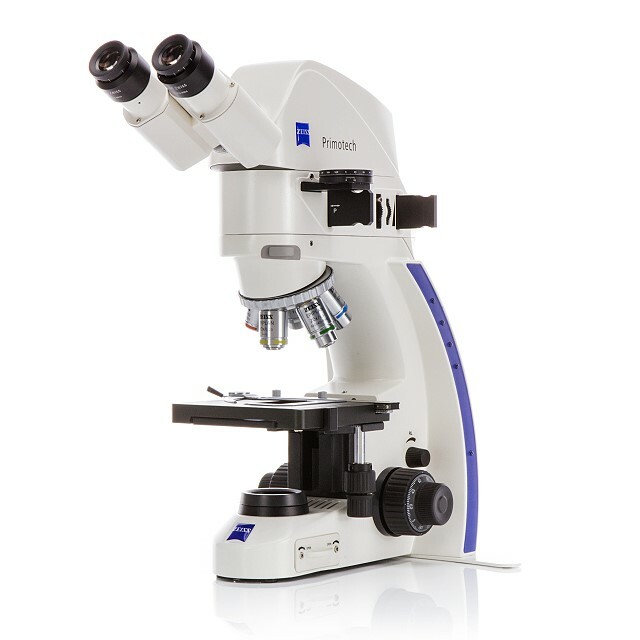 Interfaces: - 1 x RJ45 Ethernet for Tube with integrated camera - 1 x D-Sub for connection to the microscope - 1 x RJ45 Ethernet for network access In combination with the Primotech ZEISS offers the software Matscope, can exclusively be used with iPad 3rd generation, iPad mini 4, iPhone 5 or later series with iOS 9. ZEISS Matscope iOS version is free for download in AppStore. 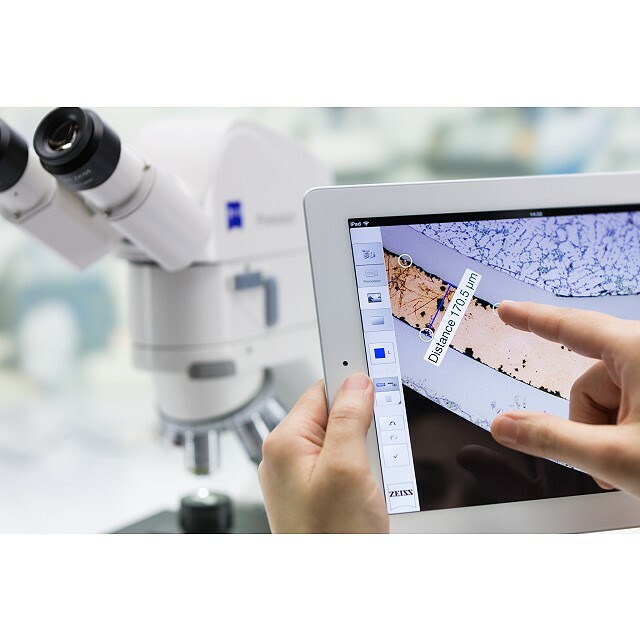 ZEISS Matscope Windows version is free for download in product webpage Unless otherwise stated by the distributor, iPad and WLAN router are not supplied by ZEISS. 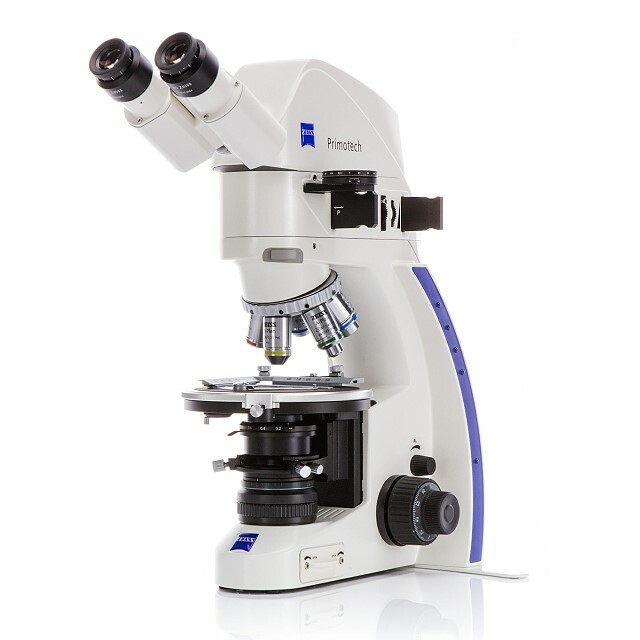 Microscope Primotech TL/Pol conoscopy rotary stage Camera Tube 3MP included - Microscope stand Primotech TL, LED, 5x W0.8 cod. Centerable with base plate, dust cover and secure lock for 6x20 slider - Transmitted-light illuminator with LED 3W 5000K - Stage- and condenser carrier with condenser 0.9 Pol - Polarizer TL 360° rotatable - Rotary stage Pol 360°, max. sample height 17 mm - Object guide Pol 35x30 mm, attachable for slides 48x28 mm and 75x25 mm - Quartz depolarizer for tubes Primotech - Bertrand system, transmitted light, focusable - Conversion filter (3200K), d=45 mm - Analyzer slider TL/RL rotat. 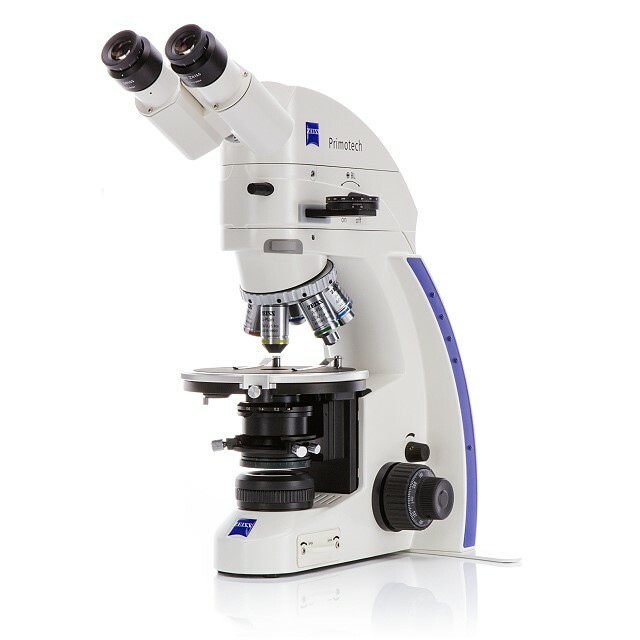 360° undetachably, lockable - Compensator Lambda, 6x20 undetachably - 2x Eyepiece E-PL 10x/20 Br.foc. - Tube 30°/20 with integrated IP Camera 3MP - Objective A-Plan 5x/0.12 Pol W0.8'' - Objective A-Plan 10x/0.25 Pol W0.8'' - Objective A-Plan 63x/0.8 Pol W0.8'' - Power supply 12V/30W - Calibration slide for App - Interface module MNA advanced, for network communication and saving of microscope configuration and scaling via Ethernet and Labscope or Matscope App. The Advanced type enables the use of full Matscope functionality including advanced measurement and automatic scaling. 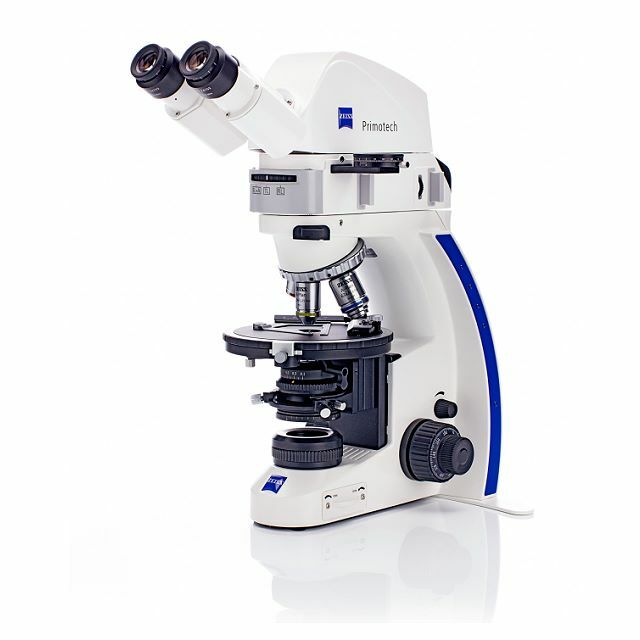 Interfaces: - 1 x RJ45 Ethernet for Tube with integrated camera - 1 x D-Sub for connection to the microscope - 1 x RJ45 Ethernet for network access In combination with the Primotech ZEISS offers the software Matscope, can exclusively be used with iPad 3rd generation, iPad mini 4, iPhone 5 or later series with iOS 9. ZEISS Matscope iOS version is free for download in AppStore. ZEISS Matscope Windows version is free for download in product webpage Unless otherwise stated by the distributor, iPad and WLAN router are not supplied by ZEISS. Microscope Primotech TL/RL Pol conoscopy rotary stage CameraTube 3MP included - Microscope stand Primotech TL/RL, LED, 5x W0.8 cod. Centerable base plate, dust cover and secure lock for 6x20 slider - Transmitted-light illuminator with LED 3W 5000K - Stage- and condenser carrier with front lens swing in/out condenser 0.9 Pol - Polarizer TL 360° rotatable - Rotary stage Pol 360°, max. sample height 17 mm - Object guide Pol 35x30 mm, attachable for slides 48x28 mm and 75x25 mm - Quartz depolarizer for tubes Primotech - Reflected-light illumination with LED 3W 5000K, turret 3x with integrated Bertrand lens for objective 63x and secure lock on slider interfaces - Conversion filter (3200K), d=45 mm - 2x Eyepiece E-PL 10x/20 Br. Foc. - Objective Epiplan 5x/0.13 W0.8'' - Objective A-Plan 10x/0.25 Pol W0.8'' - Objective A-Plan 63x/0.8 Pol W0.8'' - Compensator Lambda, 6x20 undetachably - Analyzer slider TL/RL, fixed undetachably - Polarizer slider RL, fixed undetachably - Power supply 12V/30W - Tube 30°/20 with integrated IP Camera 3MP - Calibration slide for App - Interface module MNA advanced, for network communication and saving of microscope configuration and scaling via Ethernet and Labscope or Matscope App. 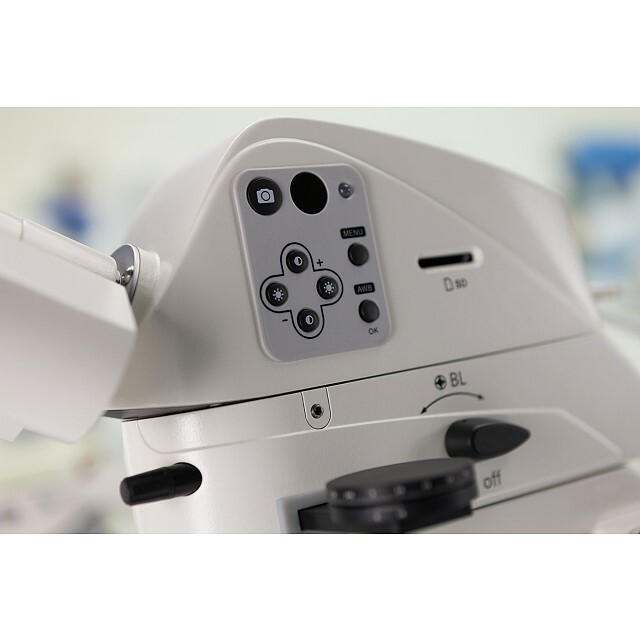 The Advanced type enables the use of full Matscope functionality including advanced measurement and automatic scaling. 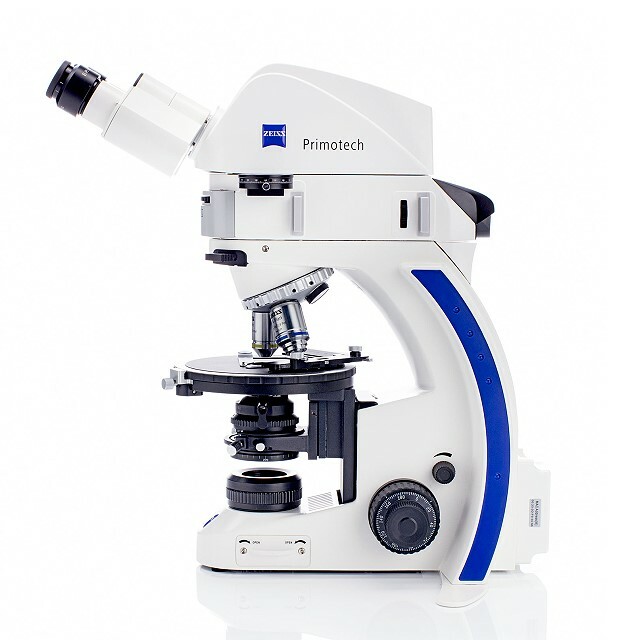 Interfaces: - 1 x RJ45 Ethernet for Tube with integrated camera - 1 x D-Sub for connection to the microscope - 1 x RJ45 Ethernet for network access In combination with the Primotech ZEISS offers the software Matscope, can exclusively be used with iPad 3rd generation, iPad mini 4, iPhone 5 or later series with iOS 9. ZEISS Matscope iOS version is free for download in AppStore. 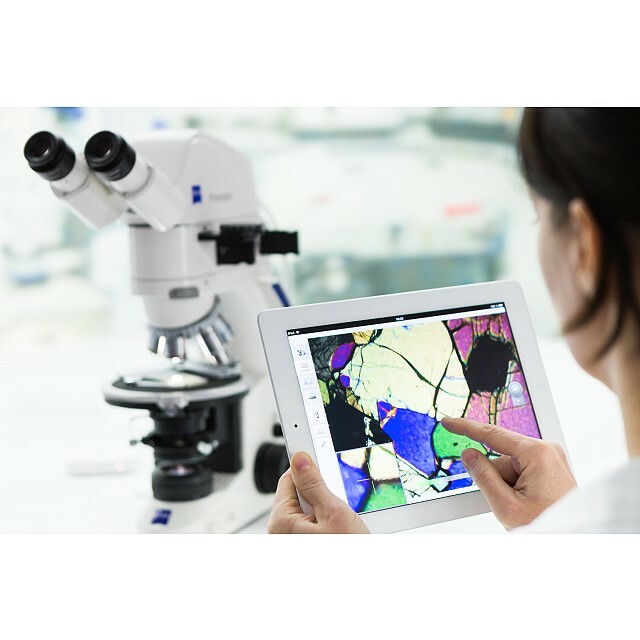 ZEISS Matscope Windows version is free for download in product webpage Unless otherwise stated by the distributor, iPad and WLAN router are not supplied by ZEISS.